Seven years ago, Susan and I celebrated our 30th anniversary on Santorini. 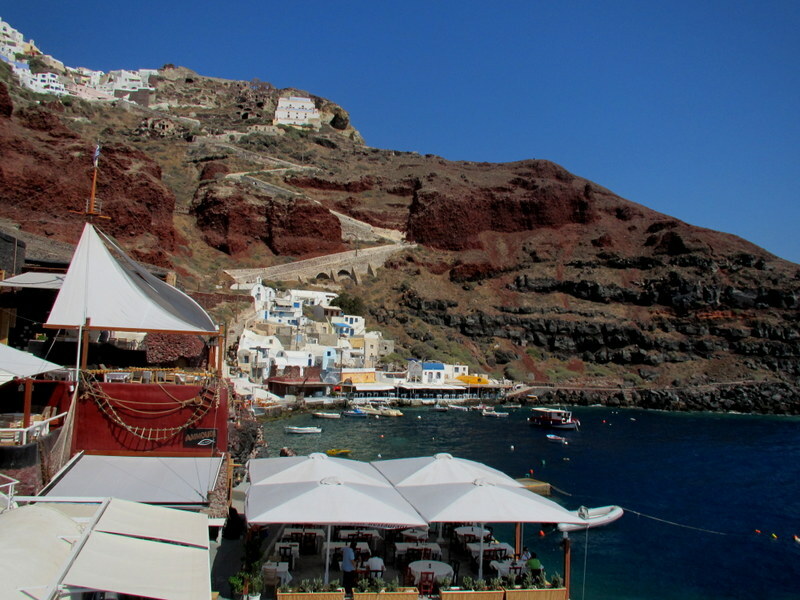 We stayed at one of the luxe places spilling down the cliffside above the caldera. Our room was a cool cave dug back into the tephra, there was an infinity pool with astonishing views over the caldera, a cafe/bar with the same views, a guy to carry our luggage up and down the cliff steps (once he had wrested it from my hands), etc. We generally stayed cliffside, walking around the big town of Fira, strolling Oia night and day, enjoying a spectacular anniversary dinner in Oia on the roof at 1800, walking — cautiously — along the trail that clings to the cliff face and stretches from Fira to Firostefani to Imerovigli and all the way around to Oia. It was beautiful, spectacular, perfect. Except it seemed to us that we hadn’t met any Greeks. 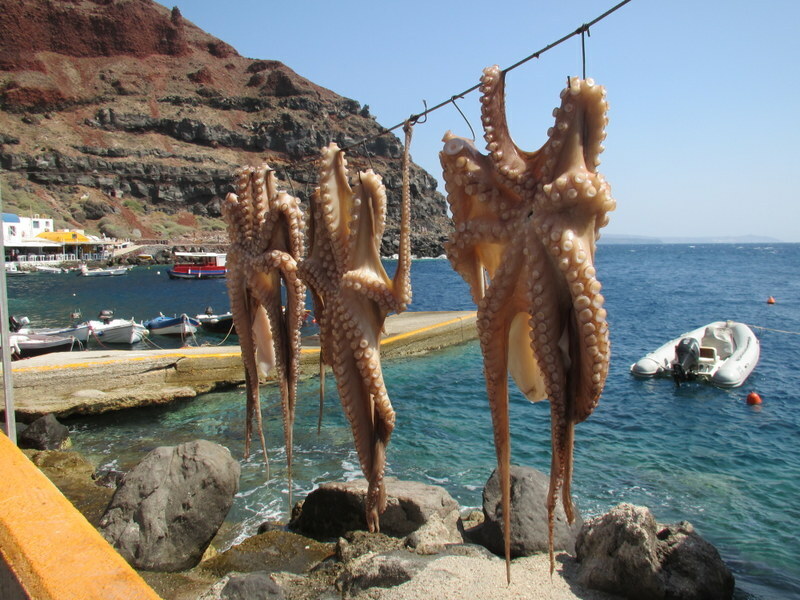 Apparently, as the tourist invasion intensified, the Greeks pulled back, with the business owners now hiring seasonal help from whatever country is cheapest and then decamping to Athens, and the other locals moving inland or to quieter islands. It was like that Caribbean island owned by a cruise ship company — beautiful and soulless. It wasn’t Greece, it was Tourist Land. (We experienced the same conditions in Venice, where a local who is trying to raise her family there told us almost everyone had moved off the island as mass tourism — cruise ships in particular — had made the place increasingly unlivable.) 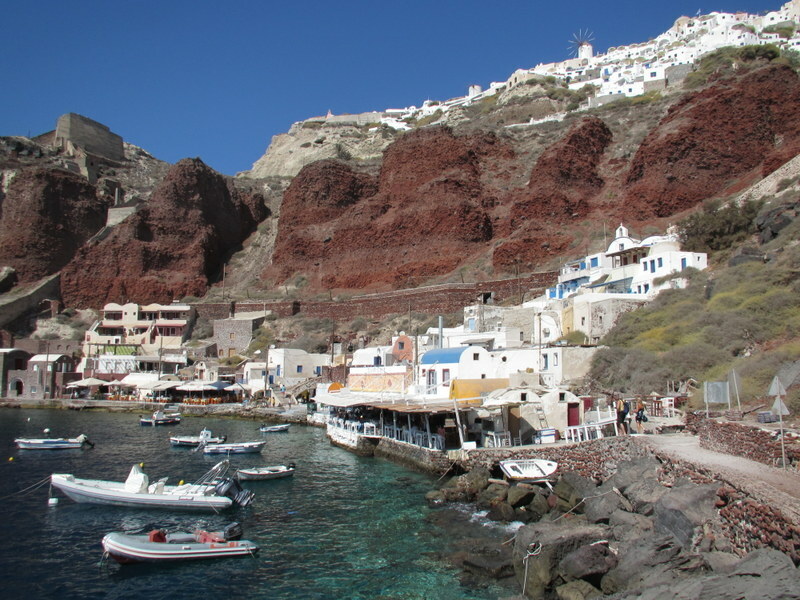 As far as we were concerned Santorini had all but ceased to be a Greek island, and we were very sad to discover that we didn’t want to go back. 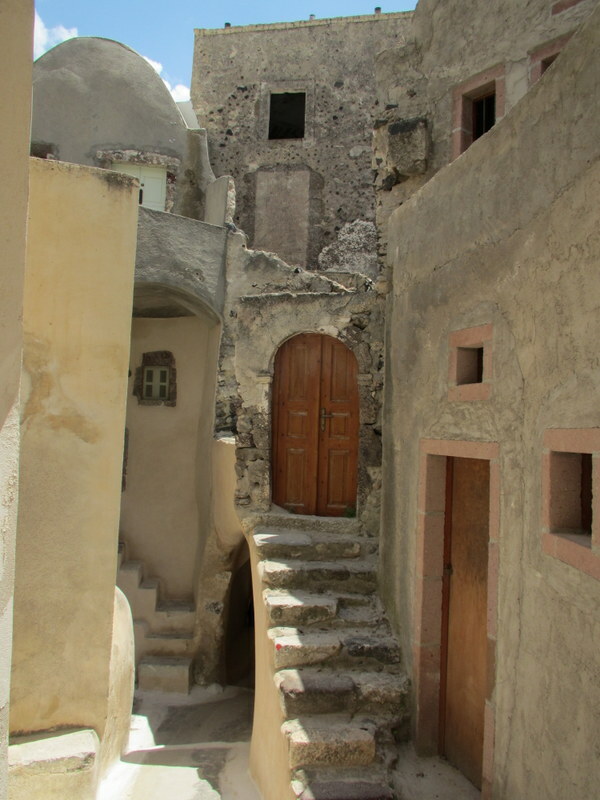 There were 5 “castles” built on Santorini at various times in the last 800 years. 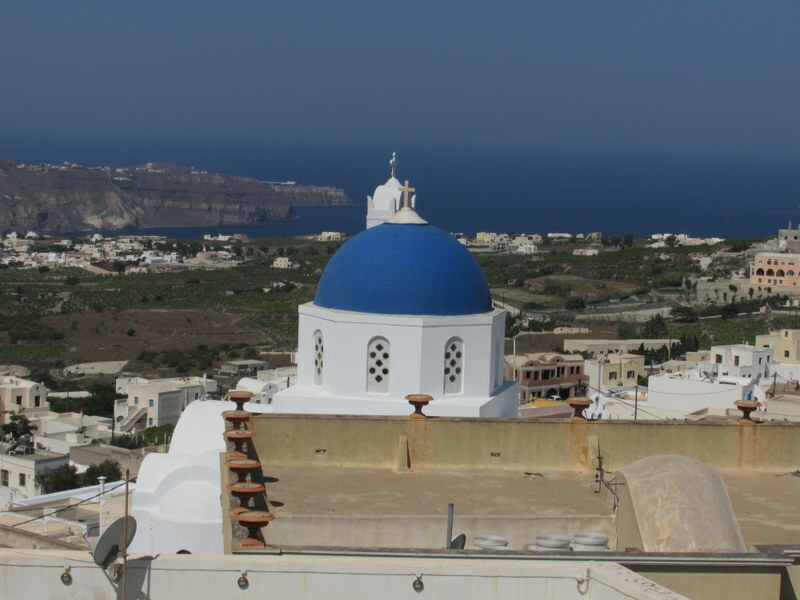 One was at the site of the cathedral that slipped into the sea in Oia, and another was in the central village of Emborio. 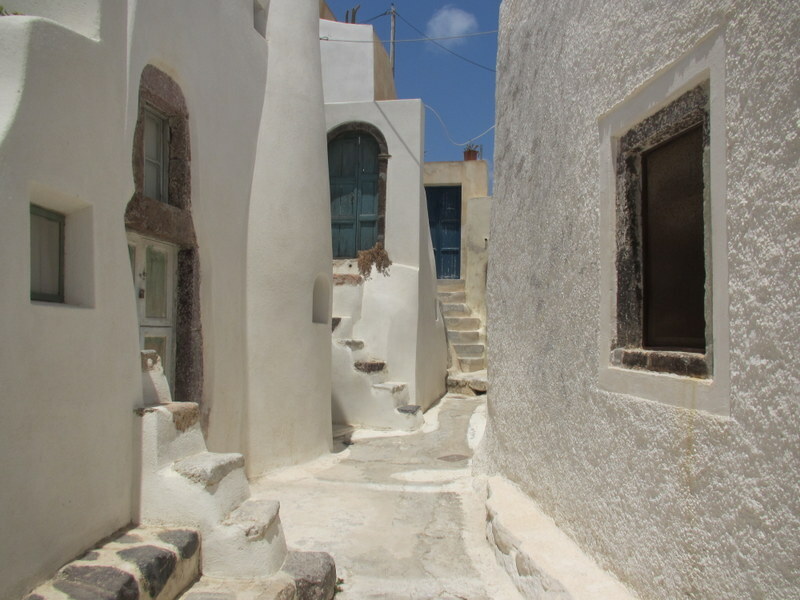 We visited the one in Emborio and, at the opposite end of the spectrum from Oia, almost had the place to ourselves. 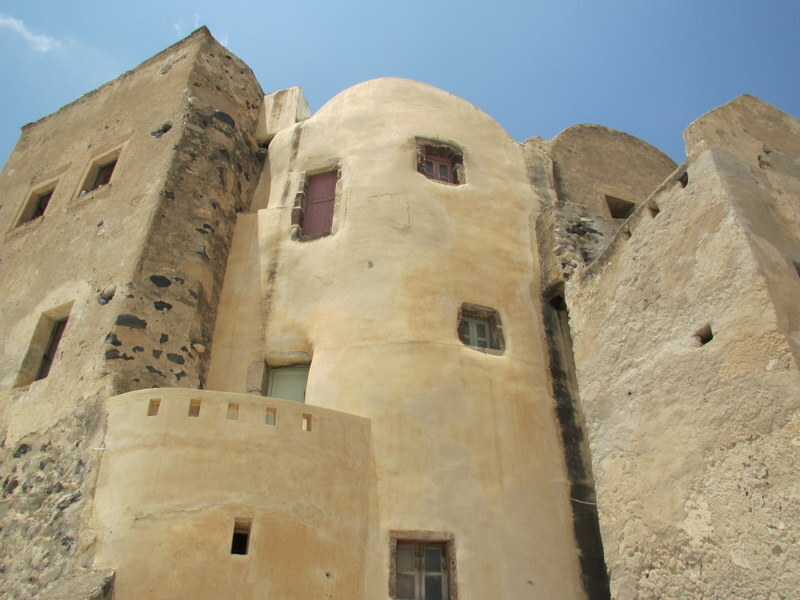 This castle consisted of a ring of houses whose exterior walls formed the defensive perimeter for the tower within. It’s wonderful wandering around the rabbit warren of streets and passageways within. Of course, there is always at least one church inside the walls as well. 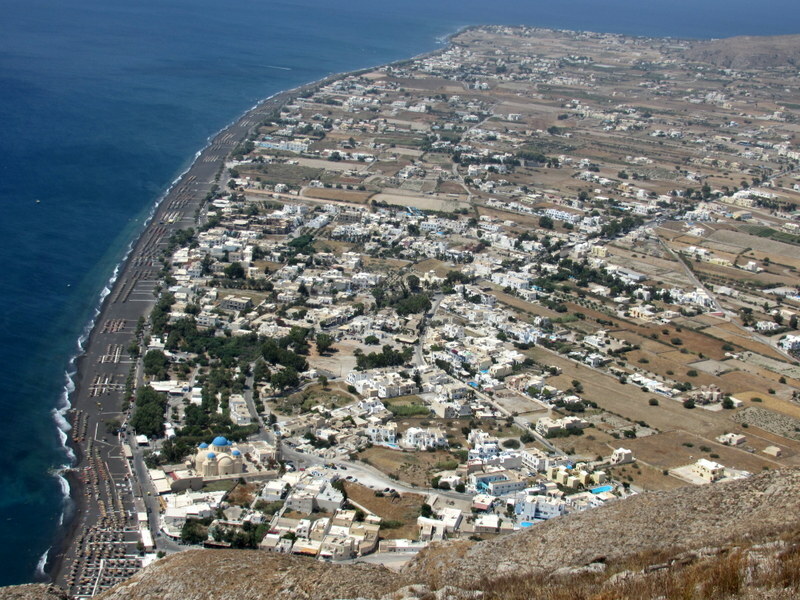 This is the village of Perissa, where we stayed, from way up in Ancient Thera. 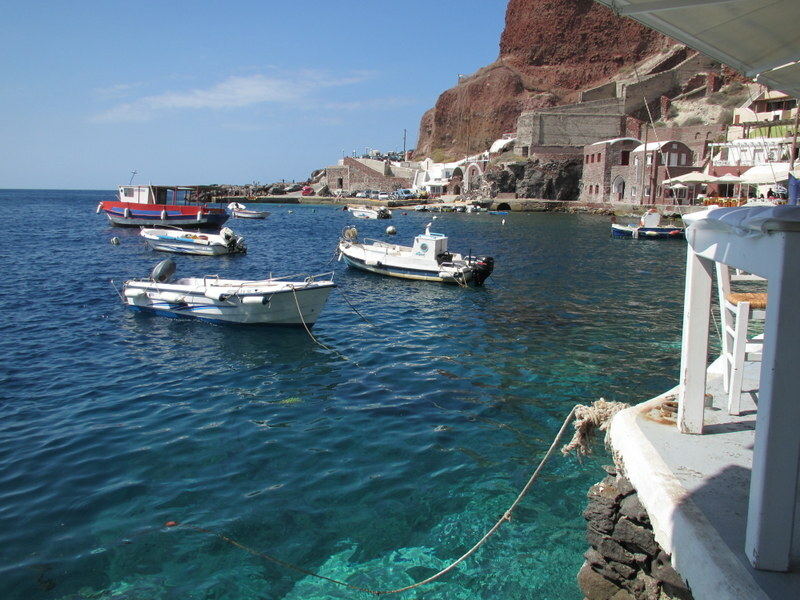 It’s a small village, with a strip of cafes, tavernas, and shops along its black sand beach. The church that stood just at the base of this mountain, St. Irene, gave its name to the island. 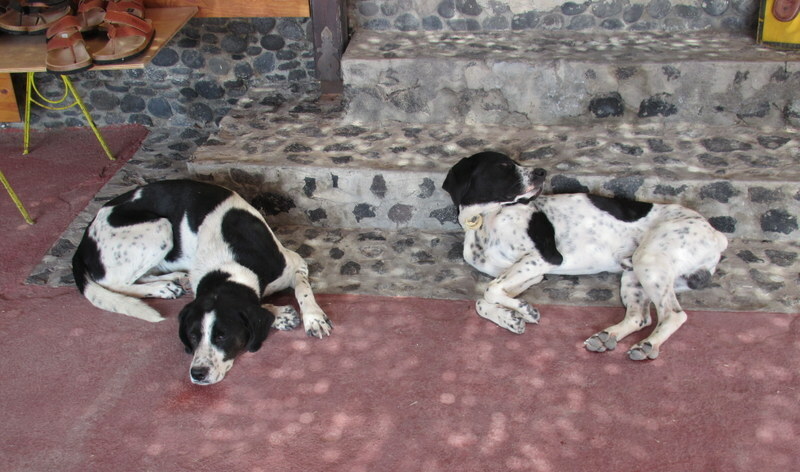 Watch dogs at a leather shop in Perissa. 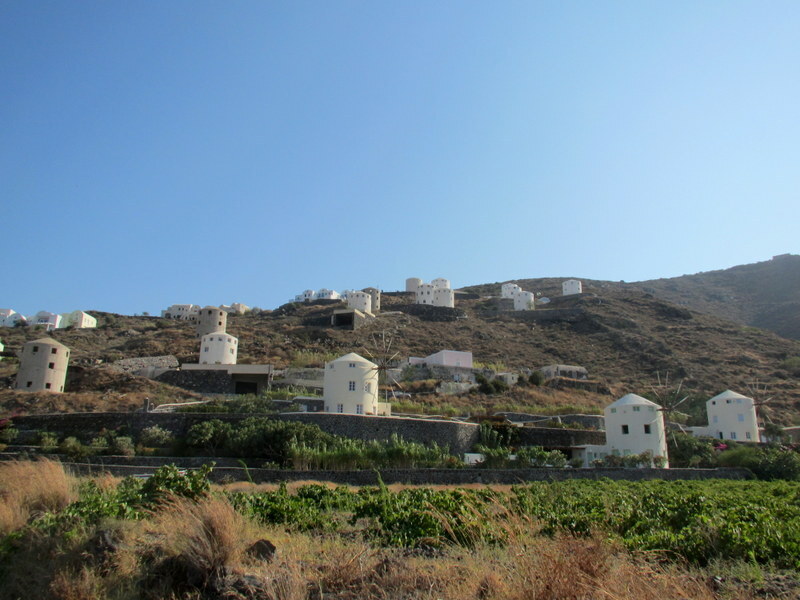 We visited the little village of Amoudi, tucked under the cliff below Oia. Its waterfront is lined with fish tavernas, and we were there for fish. Boat excursions out to the active volcano leave from the dock here. There’s a long set of stairs that you can walk or donkey-ride. We drove on the road. A community of new houses being built to look like the traditional windmills. 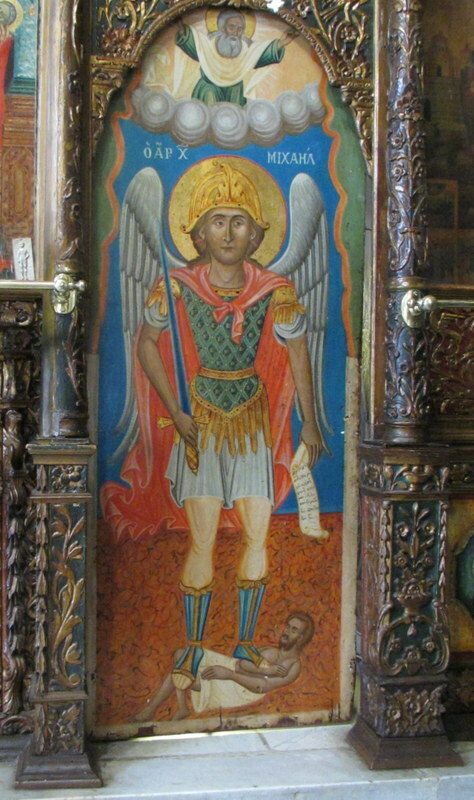 St. Michael standing on some guy. If that’s supposed to be the devil, he looks a lot like Barry Gibb. 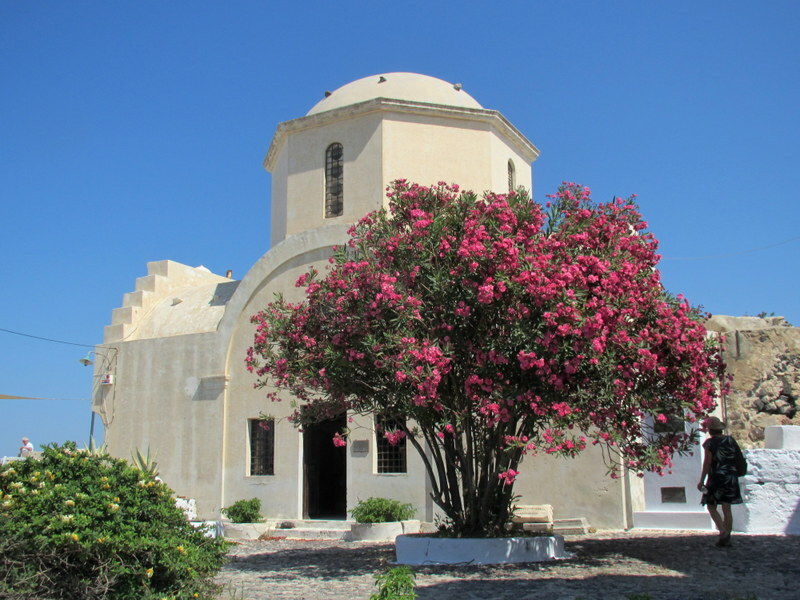 This is from the church of the Virgin of Platsani, which was built in Oia to replace the cathedral destroyed in the 1956 earthquake. 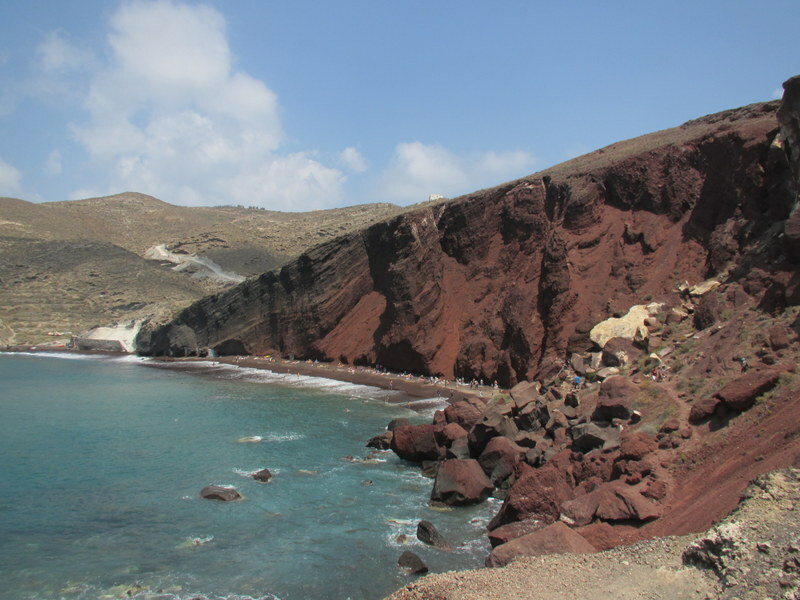 The Red Beach, near Akrotiri. Red sand/pebbles washed down from the cliffs make it a unique, and popular, place. 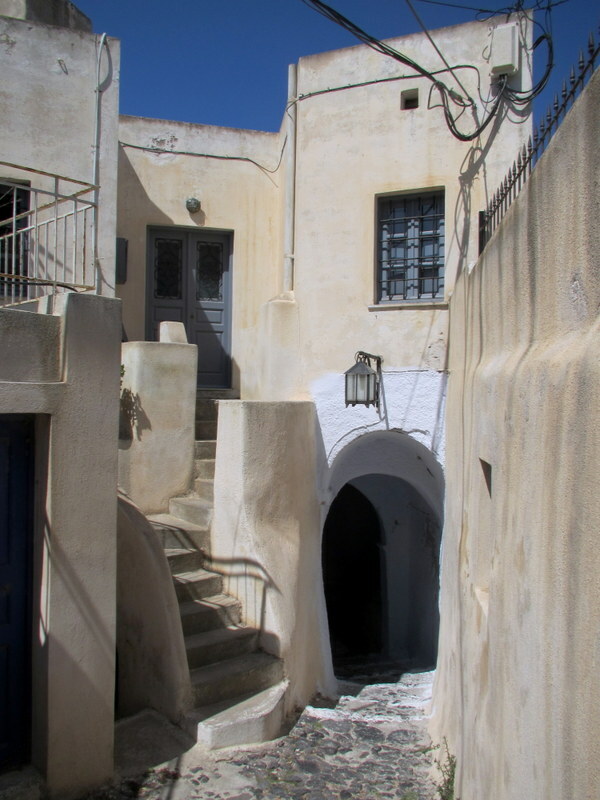 We visited another old “castle” in the village of Pyrgos, the island’s highest village. 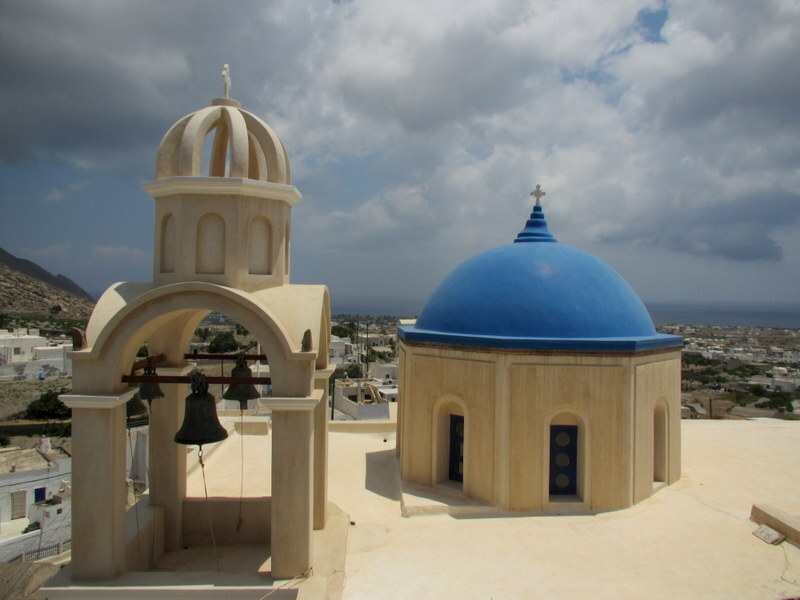 Pyrgos enjoys commanding views over most of the island, so this is where the occupying Venetians moved when they abandoned their initial castle on a rock outcropping in the cliff face (after an earthquake). Here, we’re looking all the way down to the southern point of the island. 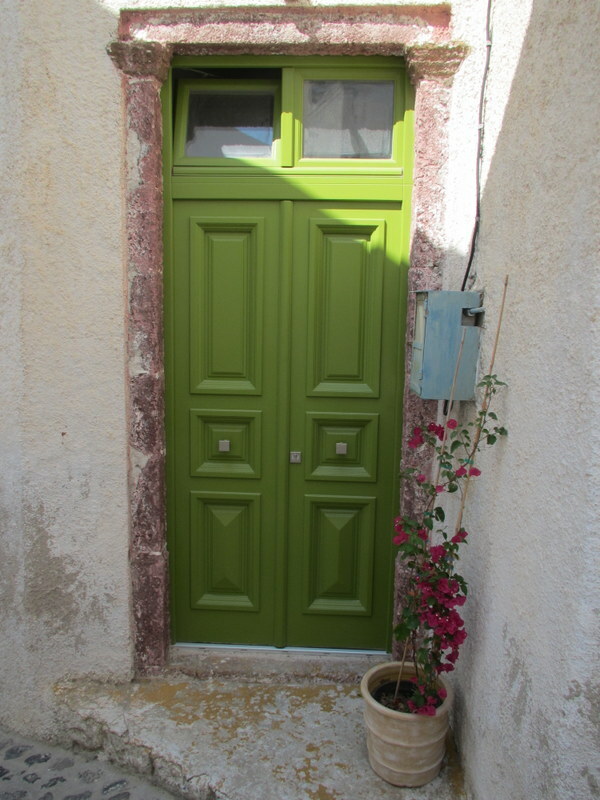 We visited a museum of traditional life on Santorini. 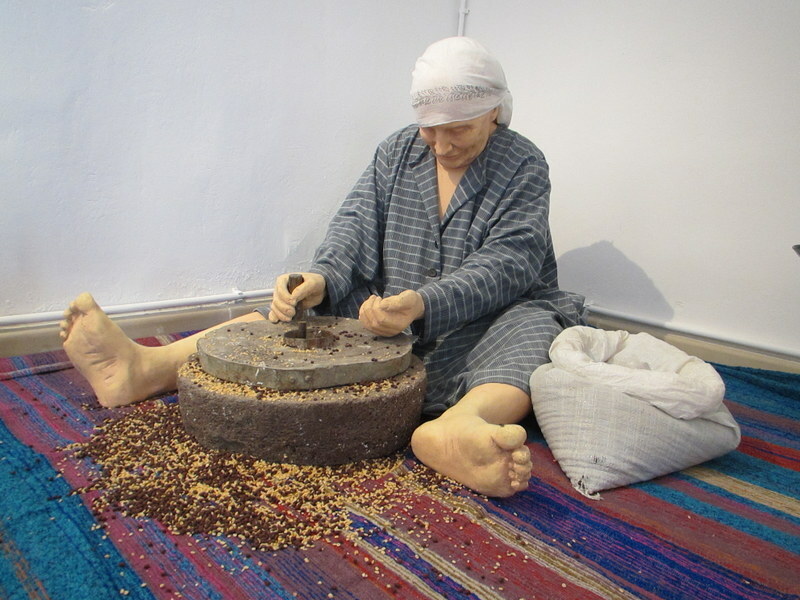 Here, a farmer’s wife shells fava beans with a hand mill. 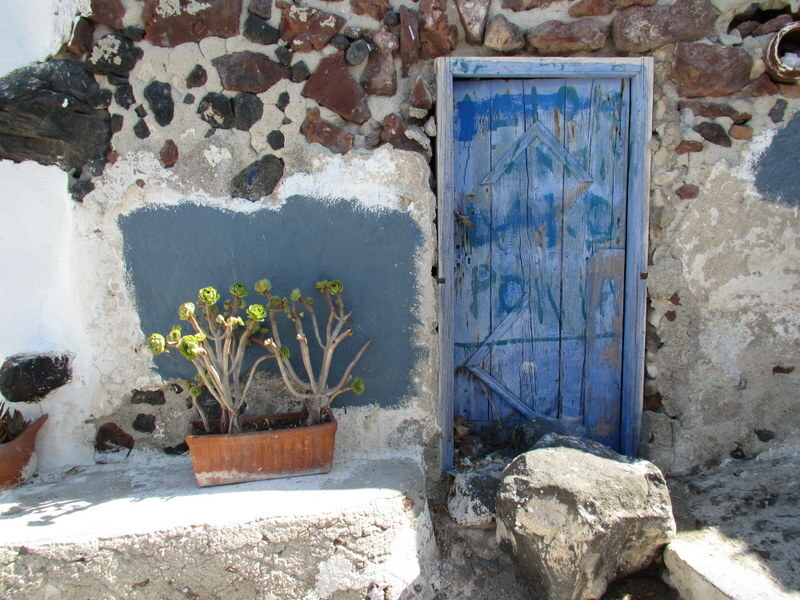 On a side street in Oia. Once again, I loved seeing your photos, which of course made me smile thinking of the places we visited with you and Sue.